Jacob is an easy-going, friendly, and outgoing guy. He enjoys engaging in conversations and learning new things from others. Jacob loves the outdoors, so much so that being on the water fishing is one of his favorite hobbies. Jacob has a vast knowledge of fish, baits, fishing rods, and everything in between, and he’s happy to teach other. Jacob is competitive in nature and always up to play any sport. 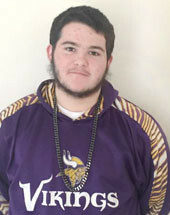 He is a Minnesota Vikings fan and dreams of playing in the NFL one day. Jacob has a creative side; he enjoys drawing, singing and song writing. Jacob is very artistic and draws in his sketch pad daily. Designing colorful creations in his mandala coloring books is one of the most peaceful ways he likes to spend time. He also enjoys playing guitar and singing his own songs. If given the chance Jacob, could play video games for hours at a time. Jacob is eager to find a family of his own who will love and support him.